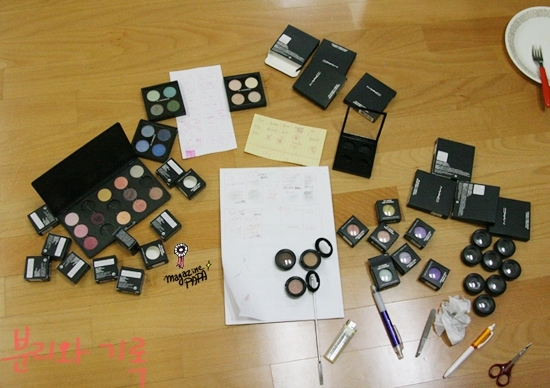 Last posting, about Etude House, I think I was out of mind at that time. I hurried it because of the next schedule. Haste made waste. I forgot to post not only a text but an image. And I forgot the picture of mixing with a spatula. I added them in red letter, and one more image. And one more thing, I won’t take any more models. I didn’t expect this great popularity. Thank you so much. At first, I intended to select only one model, but I will handle it with flexibility. I was shocked to see people who said to do modeling without pay and who just wanted to watch my work. I read all the resumes with great interest. I will announce the winner soon. I searched many brands and looked for colors I don’t have. So I will tell you about my favorite colors of Mac. I‘ll show you a list of recommendable colors. You should know that it’s not the color you use every day. I decided to post these because they are valuable and they are colors which artists prefer. I want to tell one thing to ones who Mac eye shadow. Please buy only colors that worth purchasing. 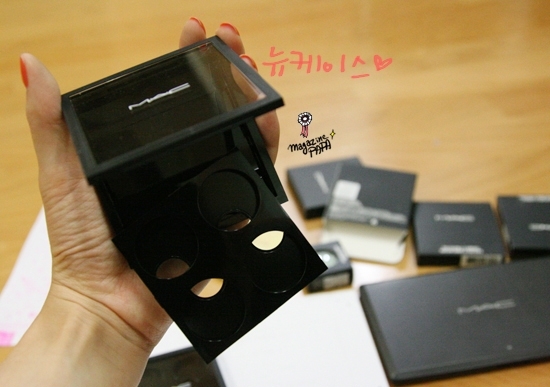 Mac Eye shadow 4 spheres case is newly released. The case seems more durable and luxurious. Its magnet helps shadow to attach and detach with its case. But if you put an eye shadow, it’s meaningless. It’s almost impossible to relocate because it can break the shadow. So, it’s better to pay attention when you first place them. Bobby Brown shadow makes it possible to recognize the color, but Mac doesn’t. Some may label the color, but I don’t want to label anything on it. So I remember the placement. My teacher said using transparent 4 spheres case is good for travelling. I used palette containing 15 colors. But I agreed with my teacher’s advice and I replaced it with 4 spheres case. 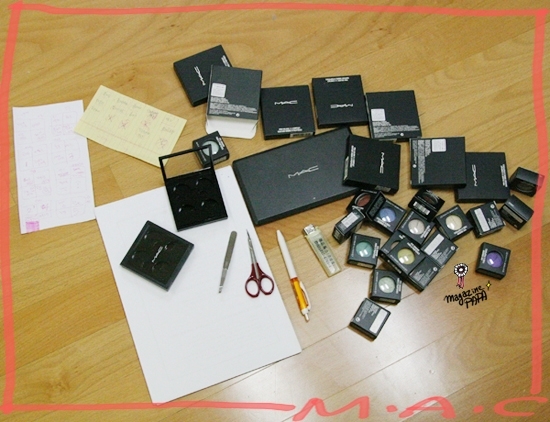 I want to join a Mac eye shadow detachment competition, if there is one. I’ve got some know-how. If you haven’t, just ask the store staff do so. After finishing it, they give a lipstick with 6 empty or used cases. But at this point, there was no lipstick that caught my eyes. I’ll wait for new colors to be released. You can pack a 4 spheres case, it’s good either you pack it with similar colors, or with colors that match each other well. There’s one more thing though it’s not on the picture. But they are not purchasable at this point. 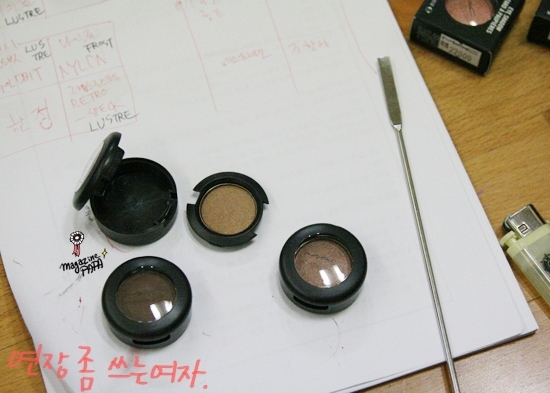 Please check beige, gold, pink, orange, and brown which every woman likes to use. You can choose others according to your taste. The colors I wrote in red are the ones I like. Above these, there are many fabulous colors in eye shadows. I wrote a list of some colors that I want to buy some time. >These colors are recommended, too. 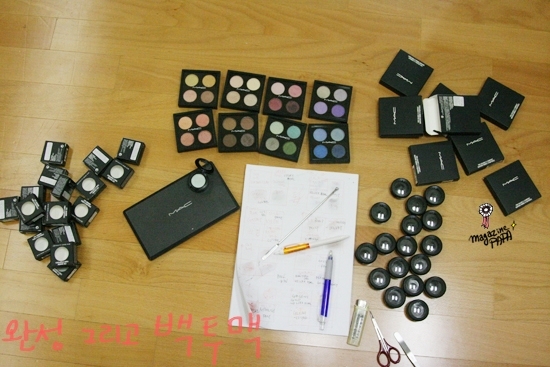 People who use eye shadows might have an upset experience of having too many similar colors. but they ended up a similar color collection. So..I’m giving you a tip. >1. Determine to stop impulse buying. : It’s the best way to prevent buying similar colors. You should be careful either when you buy colors that you use often or colors you use in only one season. Eye shadow is one that needs consideration. >2. Check the internet site. you can check the colors even in your room. So if someone recommends a color, check it through the site before visiting the store. >3. Compare it with what you have. : Gather up the similar colors. Let’s take an example. You hear good things of Mac’s ‘Espresso’. You check the internet and you find it brown tone. Then, you take out all the brown colors. And pick out some colors that seem similar to the color on the computer screen. >4. Compare them with it in coloring. : Put these colors in your bag and visit the shop. Then, compare it with the color you wanted to buy. You don’t have to bring your bag if it’s near your house. You can just test on your hand. >5. The choice is all yours. : If its color seems pretty similar, buy it if it has value purchasing, if not, don’t. It’s just for preventing thoughtless purchase!! I use most of my colors and I remember them, I hardly make a mistake. But if you don’t, it’s wise to do a color test beforehand. You should compare it with what you have. This procedure is also applied to when you buy a lip gloss or a lipstick. When you feel a sudden attraction of a product, you must use this procedure. Popular colors copy each other. The difference can be really small. With this small effect, you can save your budget quiet much.